Do you have the Ibotta Rewards App ? If not, go HERE to join! 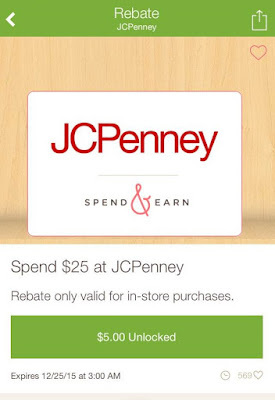 Ibotta users can get a $5 Rebate when you spend $25 at JCPenney! Just look for the JCP offer under "holiday" and submit your rebate by 12/25! Only valid for receipts dated 12/20 or after. While Supplies Last. The $25 must be met in a single receipt.